In Corona, all display objects have an anchor point. Essentially, this can be imagined as a "pin" point within the object's bounds around which all transforms occur — x/y positioning, rotation, scaling, etc. For example, if an object's anchor point is set at the top-left corner, rotation of the object will cause it to rotate around that point. 0.0 represents the top or left edge. 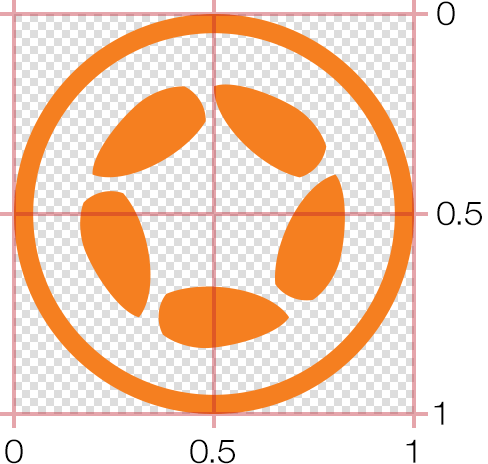 0.5 (default) represents the center. 1.0 represents the bottom or right edge. Naturally, values between (0.1, 0.25, 0.84, etc.) are also valid — these three representations simply serve as a basic reference and you're not constrained to them. The default "clamped" values of 0.0 to 1.0 accomodate the majority of usage cases, from any point along an object's outer edge to any point within it — but what if we wanted to set the anchor point to some theoretical point outside of the object's bounds? As illustrated above, setting an anchor point is based on a range relative to the object's bounds: 0 is top/left, 0.5 is center, 1 is bottom/right, etc. Similarly, assuming anchor clamping is disabled, a value of 2.0 extends the anchor 200% right or down from the top-left corner an object, while -0.5 extends it 50% above or left of the top-left corner. This is logical enough, but what if we needed to set the anchor at a specific pixel point within an object or a specific pixel distance outside its bounds? For example, what if an object was 86×90 pixels in size and we wanted to set its anchor at 12 pixels in from the top-left point? Note that if you're extending an anchor point outside of an object's bounds, you may need to factor in half of the object's width. For instance, assuming the orange circle below is 100×100 pixels in size, and you want its anchor point to be far to the left (end of the blue line), the proper calculation would be -400/100 and thus -4 for anchorX. Why -4 instead of -4.5? Because, as you can see in the diagram, the desired anchor point is 400 pixels outside the left edge of the circle, and since 0 represents the circle's left edge, the portion of the blue line that extends into the center of the circle (50 pixels) can be disregarded. With this optional setting, you have access to virtually any anchor point inside or outside an object's bounds, and with some simple math, you can even pinpoint an anchor point at a pixel location relative to an object's bounds.